Bad news for those who love nature, tigers and believe in sustainable development: Sundarban - world's largest delta, a UNESCO world heritage site and home to the Royal Bengal Tigers - has just chosen thermal power over renewable energy. Early this month, Manish Gupta, the power minister of West Bengal - the state where Sundarban is - inaugurated the supply of grid power. Later, the minister said that this is 'just the beginning', that the government had decided to extend grid energy throughout Sunderban. And this is happening when Rio 20+ or the Earth Summit - where the world is gearing up to adopt green economy and sustainable development - is just a few weeks away. I am finding the news too hard to digest. And I have reasons: for nearly a decade, Sundarban has been seen and talked about as the biggest hub of solar energy in India. Way back, in 2001, the delta became famous for having India's largest solar power station that provided electricity to 400 houses. Around that time, the government actually announced that grid power would not be extended to Sundarban. Looking back, who would have known that the government's decision to light up Sundarban with clean and green power would be so short-lived? Anyway, soon after that government announcement, there was news of Sundarban adopting solar power in a big way. For example, WWF- India set up a micro solar power station at an island called Satjelia. Others like Tata Energy Rersearch Institute also stepped in, starting small, but effective solar photo voltaic projects in the area. Then, in August 2011, government of West Bengal invited bids for the India's largest renewable energy project in Sunderban. That year, the state government was even given the World Clean Energy award in recognition to its effort to supply Sundarban renewable energy..
And now comes this bad news. So, why is this news bad? Because, the entire Sundarban is an ecologically sensitive zone. 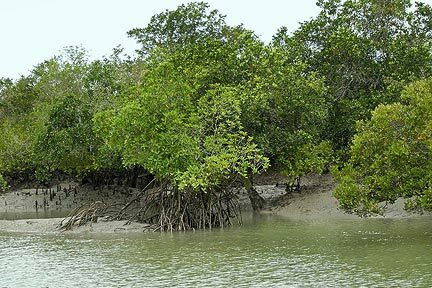 The delta, with its rare mangrove forest and rich wildlife, is already threatened by climate change such as massive cyclones and fear of complete inundation by rising sea level. Solar and other renewable energy are seen as ideal for this delta and much safer than connecting it to thermal power grid by setting up transmission towers, stations or setting up extension lines etc on soft ground. Besides, reports have shown, connecting Sundarban to grid is also costlier than lighting it up with renewable energy. It is really difficult to understand why the state government has decided to overlook this. The state had a new government a few months ago which is led by Mamata Banerjee - whose election slogan was 'Poribartan'/change. Well, going by Sundarban, this definitely is not a change one should vote for! Unfortunately, tigers can't speak for themselves.